Dr. Charles Moore covers topics including treatment of gout, psoriatic arthritis, and the clinical presentation of Sjögren's syndrome and sicca syndrome. In this first of a two part series, Dr. Charles Moore discusses ankylosing spondylitis, polymyositis/dermatomyositis, inclusion body myositis, anti-synthetase syndrome and scleroderma including epidemiology, clinical manifestations, diagnostic criteria and treatments. 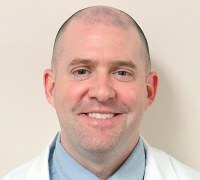 Dr. Moore is an assistant professor of Medicine at University of Louisville in the department of Rheumatology. He trained in Internal Medicine and Pediatrics at University of Louisville and then completed a fellowship in Rheumatology at Vanderbilt University. He staffs the adolescent transition clinic for the older patients in pediatric rheumatology and the lupus clinic monthly and the faculty practice clinic several times per week. Dr Moore's clinical research interests in health services include early detection in both RA and SLE and interventions aimed at enhanced follow-up rates in both these illness and in adolescents.